If you have any questions or want to enquire about dates, use our form to contact Nicola Contreras or see their website for more information. Perched airily above one of Spain’s loveliest pebble coves, beautifully and personally decorated, this house dazzles as soon as you step inside. It was designed in two stages by two hands but its quirks add to its specialness – there cannot be another like it, it’s a symphony of luscious white shapes and blond timber, the perfect holiday house. You have the turquoise water to the east and the green nature park to the west, a splendid paved pool, a couple of terraces and plenty of sitting space indoors. The oak door headrest of the big bed gives the top-floor master bedroom great character, it has both balcony and roof terrace, bath and shower. Other bedrooms, though smaller, are just as attractive and the constant sound of wind and waves covers any noise the neighbours might make. Dive into classic Spanish seaside life in Javea and Moriaria, spend all day snorkelling among the rocks of ‘your’ cove: there are bars for survival; or turn away from the sea to explore the marvellous walking paths of the Granadella Nature Park; or drive into the interest-packed hinterland. A fine place for families and friends. Minimum stay: 5 nights. Pets by arrangement. We had a wonderful stay at Casa Calita, the villa is beautiful and very tastefully designed & decorated to a high standard. The layout suited our family perfectly as there are bedrooms & bathrooms on all 3 levels giving privacy to suit a family of 2 adults & 3 teenage children. The views & setting are stunning, very peaceful and our favourite place was the cove at La Granadella, a special place indeed, plenty of snorkelling, crab fishing. Car needed as no shop in walking distance. Catherine who greeted us was extremely helpful & kind. We hope to return and will certainly recommend to all. 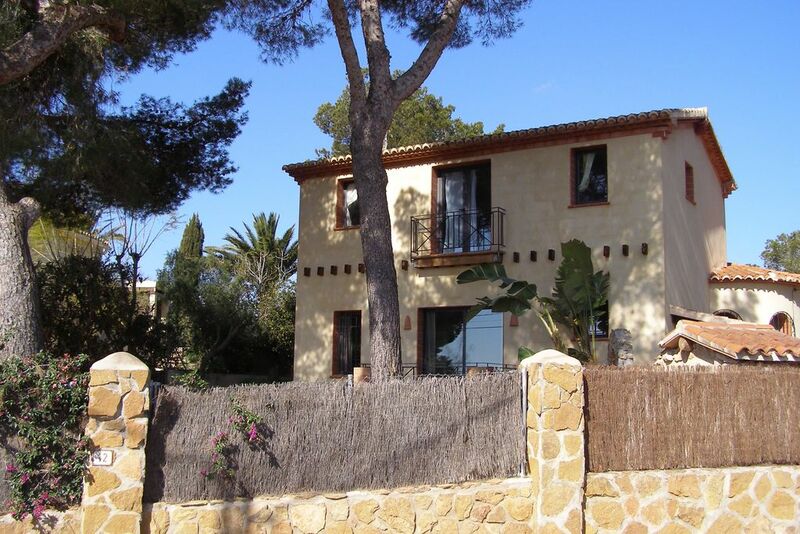 The villa is ideally located and decorated to a high standard and only a few km's outside of Javea, with sea views from the front and mountains at the rear. We stayed for 10 nights with 3 teenagers, the villa gave everyone the space to relax and have fun. Nicola was very helpful with lots of suggestions regarding local beaches and restaurants. We visit this part of Spain regularly and will definitely be rebooking. The large room at the top of the house with its own terrace is stunning. We stayed at Casa Calita, Granadella Bay villa during a week in September, 2016 and enjoyed every minute. We would describe it as a boutique holiday, very special. This house was not only recently renovated but also re-designed and decorated to a high standard, you would feel a very good taste all-over. Car is essential to stay in this villa. A few minutes driving down the hill there is Le Granaldine beach with crystal turquoise water. Xabia is a nearby lovely town just in 10 minutes driving. Nicola, the owner, is a very nice person and Louise, who looks after the house, was very helpful. Newly decorated and furnished architect designed house between nature and sea. Front balconies look through pines over cliff side rooves to the sea, and rear west facing terraces and pool back onto the wild Granadella Natural Park. Walk down a private lane in 20 mins (or drive 2kms on the Natural Park road) to the beautiful Granadella Cove to swim and snorkel in crystal clear sea. Sit under thatched parasols on the beautiful smooth white pebble beach. Bring your swimming shoes! Eat and drink at 3 bars / restaurants down at the Granadella Cove, or follow trails and footpaths in the natural park. Visit Javea Yacht club in the old port for lunch or dinner. Non members welcome. Go for pizza at the boules club, 2 km from the house. Lovely 'La Cocina' near Javea port has vegan and gluten free items on interesting Indian/Taiwanese/Thai menu. Buy some antiques at the Javea Antique shop in the old town, go for tapas, explore the little streets and the indoor food market.